Nosh Detox is an award winning company that provides personal, bespoke nutritional programmes, supplements & therapies. It offers a range of products including smoothies, juices, detoxes, infusions and medical kits. 3 years ago Nosh Detox were selling their products through Amazon, without much success. They asked Click Digital Growth to take control of their Amazon account and revolutionise their offering and sales, to great success. Within a year sales were up 400% and we took on their ecommerce website project and ongoing digital growth strategy. Nosh Detox's website was designed to portray the fresh & colourful impact that their products do. We developed a very clear navigation process to make it easy to find the right products for the customer. Additionally we provided all the key USPs in a prominent position answering any speculative questions the customer has straight away, allowing them to navigate through the website immediately. 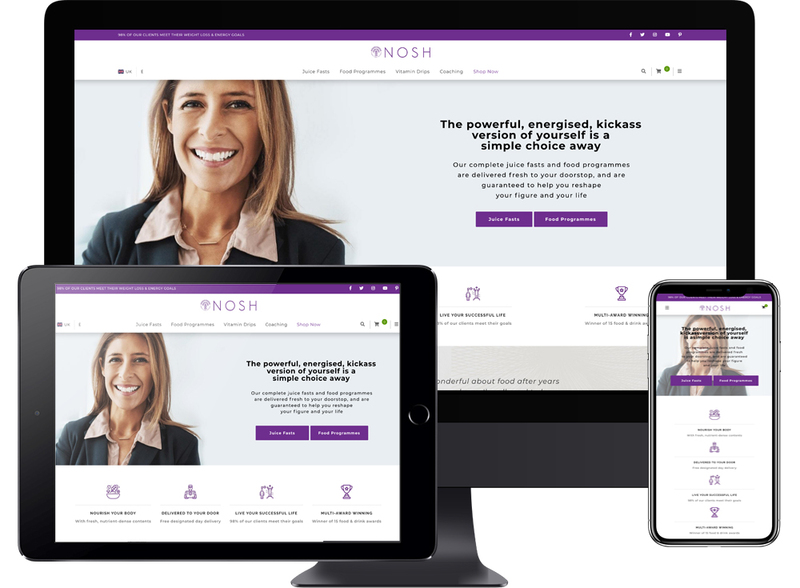 We work closely with Nosh Detox on their ecommerce website, offering regular A/B and user testing to ensure the customer journey is optimised for conversions and eliminating any barriers. Their new website design has increased the conversion rate significantly, as well as average order value, effectively meaning they convert more visitors to their website without having to spend significant financial resources on advertising and marketing. I wanted to say thank you for all your effort and attention on the website. As you promised its been better and better and its making more and more money each and every week.